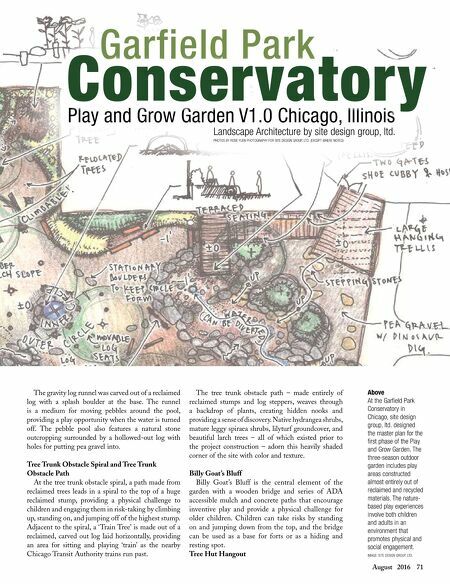 70 Landscape Architect and Specifier News The Play and Grow Garden V1.0 at the Garfield Park Conservancy (GPC) is the first of a two-phase project to engage children in play with the natural environment. 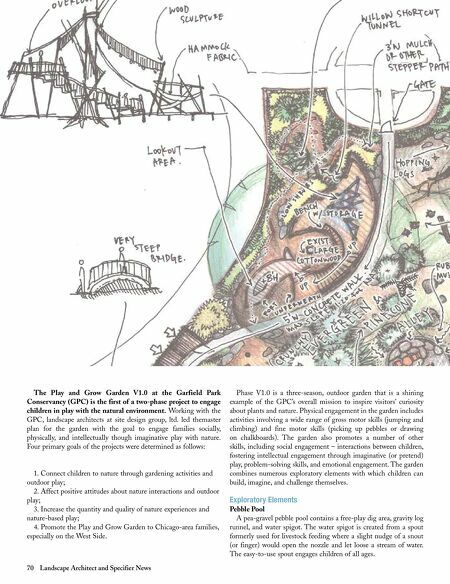 Working with the GPC, landscape architects at site design group, ltd. led themaster plan for the garden with the goal to engage families socially, physically, and intellectually though imaginative play with nature. Four primary goals of the projects were determined as follows: 1. Connect children to nature through gardening activities and outdoor play; 2. Affect positive attitudes about nature interactions and outdoor play; 3. Increase the quantity and quality of nature experiences and nature-based play; 4. Promote the Play and Grow Garden to Chicago-area families, especially on the West Side. Phase V1.0 is a three-season, outdoor garden that is a shining example of the GPC's overall mission to inspire visitors' curiosity about plants and nature. Physical engagement in the garden includes activities involving a wide range of gross motor skills (jumping and climbing) and fine motor skills (picking up pebbles or drawing on chalkboards). The garden also promotes a number of other skills, including social engagement – interactions between children, fostering intellectual engagement through imaginative (or pretend) play, problem-solving skills, and emotional engagement. The garden combines numerous exploratory elements with which children can build, imagine, and challenge themselves. Exploratory Elements Pebble Pool A pea-gravel pebble pool contains a free-play dig area, gravity log runnel, and water spigot. The water spigot is created from a spout formerly used for livestock feeding where a slight nudge of a snout (or finger) would open the nozzle and let loose a stream of water. The easy-to-use spout engages children of all ages.